The Anzac Day holiday this year has once again prompted pages and pages of articles in the capitalist press claiming to ‘honour the bravery and sacrifice’ of the members of the Australian and New Zealand Army Corps (ANZAC). Rudd, like all of his predecessors, claims the day is about the celebration of ‘wonderful values’ including mateship and decency. Whilst Rudd and other establishment figures like to talk about mateship and decency really they stand for nothing of the sort. The question is why are they so keen for us to celebrate the Anzac tradition? Anzac Day commemorates the events at Gallipoli on the Turkish coast during 1915. Because of a navigational error, the Anzacs came ashore about a mile north of the intended landing point. Instead of facing the expected beach and gentle slope they found themselves at the bottom of steep cliffs. This put the Turkish troops in an ideal defensive position. As the Turkish troops saw it, they were defending their homeland from an unprovoked invasion and they put up a strong fight. The Anzacs maintained their position but found it impossible to advance. After almost nine months of stalemate, they finally withdrew. During this time Australian and New Zealand casualties reached 8587 killed in action and 19,367 wounded in the line of duty. At home the war was not exactly popular in October 1916 and again in December 1917 the Australian people voted against conscription. In Australia there was no conscription to the First World War. This was not because the government didn’t want conscription but because of a massive campaign waged by the labour movement. As a reaction to this campaign the government held the first Anzac Day march in 1916. This was an attempt to stem the growing tide of revolt against conscription and to divert the anger of returned soldiers away from the government who had sent them to war. The Anzac myth was used by the establishment to promote nationalism and ensure returned soldiers did not move into the arms of the labour movement. For many years it seemed as if Anzac Day had almost died away but in the mid 1920s it was revived. The RSL (then called the RSSILA) was suffering from a loss in membership but it managed to rebuild on the basis of building RSL clubs and giving financial support to ex-soldiers. This was important at the time as it was perhaps the only thing that kept many ex-soldiers going during the depression. During the Vietnam War Anzac Day was extremely unpopular and was often the target of anti war protests. After Vietnam, Anzac day again almost disappeared. It was re-revived in the 1980s by the Hawke Labor government. Again it was used by the government to promote nationalism and divert workers attention away from the class issues of the time such as wage cuts, job losses and cuts to social spending. Rudd’s intention today is to continue to instil this sense of solidarity with the government and the establishment therefore cutting across all of the current class issues including the dark clouds gathering over the economy. It is no coincidence that the establishment has pushed for the revival of Anzac Day in the past ten years. Nor is it any coincidence that this revival has coincided with attacks on the living conditions of ordinary people. 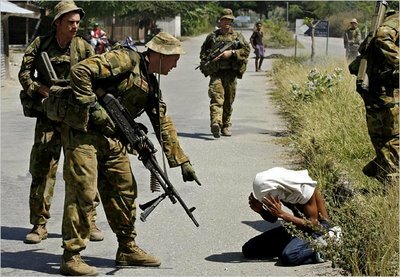 Those are aussie soldiers , not kiwi. They all died for a cause that no one believed in. They are the unsung hero’s who never will be truly commemorated. They died for a country that will never truly acknowledge their supreme sacrifice. They died in a land that, before they arrived, didn’t even know the name of. They were the innocent who died for a peace that was never stable, that many knew would never last. “How vile and despicable war seems to me! I would rather be hacked to pieces than take part in such an abominable business.” –Albert Einstein. “It is pitiful to see men, not long ago strong and healthy, now with drawn faces and staring eyes, struggling towards the firing line. Most of them should be in hospital. They are cheating death but only just. They are the walking corpses – the ghosts of Gallipoli.” –Joe Murray. The words ring true. They are the fear and the pain left in the hearts of those who remember them. The empty hole left only by the dead. Peter Scott Ramsey had the right idea, fighting of his beliefs in the face on unimaginable adversity. I wish there had been more like him and less like the government lackeys who decided who should die and who should live. “Name an emperor who was ever struck by a cannonball.” –Charles V of France. Napoleon came close. Apparently before the battle of Waterloo s British artilleryman spotted L’Empereur doing a bit of forward reconnaissance, as he was renowned for doing. The gunners were expecting to have a shot at him when their commanding officer informed them that it was not the duty of an officer to fire upon another officer. The triumph of class over all! Please change either the picture or the caption to the photo. I am offended that you speel on about history and how every one else made mistakes and we don’t live in a better place because of their efforts yet you cannot honor us the serving by even knowing who we are, what we look like and how we do our jobs, the Aussies have a bad rep and that photo shows it, Kiwis do a fantastic job and it shows in the faces of the locals. Shame on you for choosing this day to talk politics ANZAC day is to honor the fallen. Yes we have learnt from the mistakes of the past… thats why we have the book of “why”, it serves a reminder to us as to why we dont do stupid stuff anymore. Peace be the norm.